Not all monitors are the same when it comes to ergonomics. Some displays have a fully adjustable stand with good adjustment ranges, such as the Dell U2718Q and the ViewSonic XG2402. Others are much more limited, with their fixed stand only offering a tilt option. If your monitor has a very limited stand, the solution is to mount it to a flexible monitor stand or arm mount. Doing so will also make for a more clutter-free desk, which is especially great if your desk is on the small side. However, shopping for the best monitor stands is not as easy as you might think, considering there are dozens of options out there, from high-end arm mounts to simple monitor risers. We’re here to make things a lot easier for you. In this guide, we have compiled the top 10 monitor stands currently out on the market. The products included here range from single monitor arms to an arm mount capable of holding up to four monitors. Sturdy gas spring arm, full adjustment options. Can support large, 34-inch monitors, sturdy arm construction. Well-secured clamp, can support large monitors with ease. While there are fewer specs involved compared to monitors, shopping for monitor arms and stands is not an easy task. There are different kinds of mounts, each tailored for a specific setup, so you can’t simply go in and buy the most popular product on the market. Below are the most important things you need to keep in mind when it comes to stands and arm mounts for monitors. 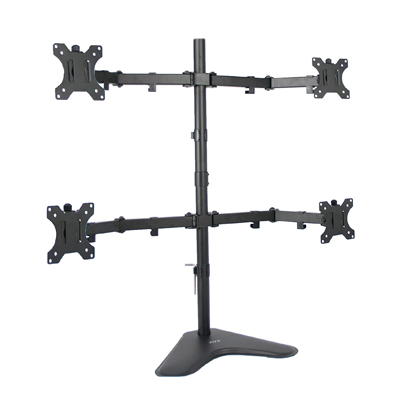 A monitor stand can refer to two things: a monitor arm mount and a monitor riser or platform, with the former being the more common type and the first thing most people think of when monitor stands are mentioned. An arm mount is exactly what it sounds like – a flexible, arm-like support with one end equipped with a VESA mount that attaches to the back of your monitor. 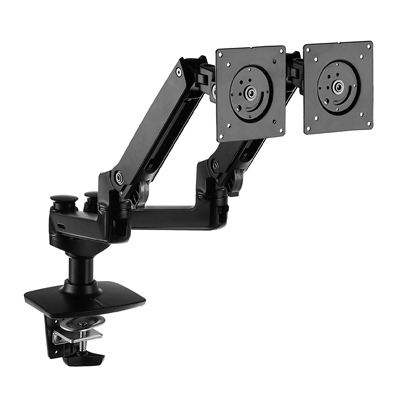 Many arm mounts attach to the table via a clamp or a grommet, but there are also products that simply come with a flat base for counterbalance, similar to a monitor’s default stand. 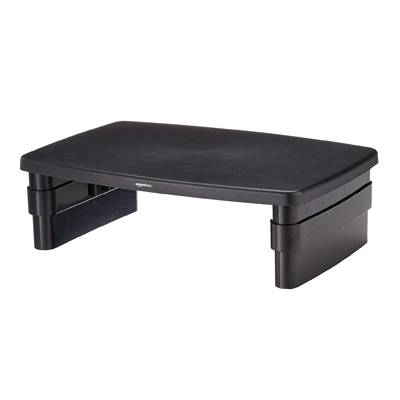 Monitor risers, meanwhile, simply look like mini desks that sit on top of your work desk. Some even come with drawers and compartments for your smartphones, pens, and books. Monitor risers offer an immediate height boost, which is great if your monitor has a fixed stand with no height adjustment option. While most monitor risers have a fixed height, some offer height adjustment in the form of adjustable legs. Unlike arm mounts, monitor risers don’t attach to your monitor via a VESA mount; they are simply small, raised platforms where you place your display. 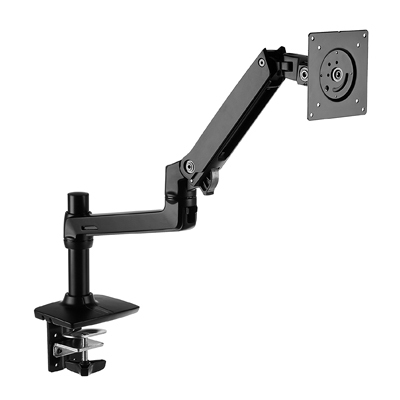 Arm mounts are recommended if you want a more clutter-free desk and more control over your monitor’s positioning. 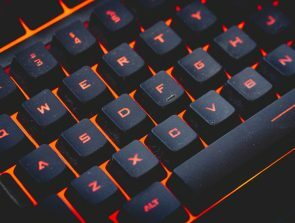 Monitor risers are great if you simply want to increase your monitor’s height, though some models also double as storage for your small belongings. Some monitor arms can only support a single monitor while others can support more than three monitors. It’s easy to check how many monitors the mount can support without even looking at the product description. You can tell by simply looking at the product images. However, it’s worth noting that a few models are being sold as a dual and triple monitor mount, with different supported screen sizes for each setup. Most monitor risers can only accommodate one monitor, but there are some that are designed for two or three monitors. However, for a multi-monitor setup, it’s best to use dedicated multi-monitor arms since they offer better flexibility and take up less space compared to multi-monitor risers. Not all monitor arms are universal regarding supported screen sizes. While there are mounts that support monitors larger than 30 inches – like our top pick in this guide – there are mounts that can only support 24-inch displays. If you own two differently sized monitors and are shopping for a flexible dual monitor arm, make sure the mount can support both of your monitors’ sizes. Monitor risers, on the other hand, can support pretty much any screen size as long as the monitor isn’t beyond the weight capacity and the base of the monitor’s default stand isn’t too big for the riser. If you own a monitor whose default stand takes up a large space – like the Samsung C27HG70 – then you may have issues fitting it on a monitor riser. 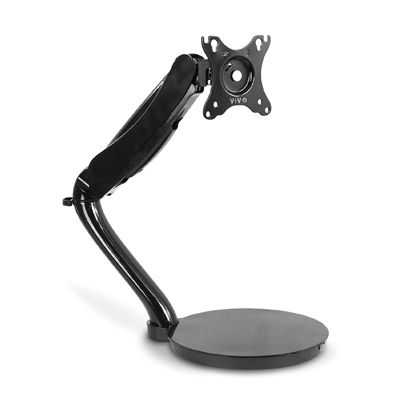 Monitor stands and arm mounts are rated for different weight capacities, with the max weight typically mentioned in the product listing, allowing you to quickly see whether or not the stand can support your monitor. For multi-monitor arms, companies usually list the max weight for each arm instead of the entire unit. You can mount different monitors to a multi-monitor arm as long as they are within the weight capacity. When checking your monitor’s weight, either in the included manual or on the manufacturer’s website, make sure you are looking at the weight of the monitor only, without the stand. Some companies list both the with-stand and without-stand weights of their monitors. Others, however, are not in the same boat, only listing the weight of the entire unit and the shipping weight. 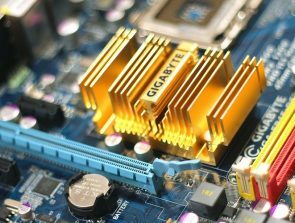 In case your monitor’s specs are not specific about what the listed weight is referring to, you can check a third-party online database or a hands-on review. Having more screen adjustment options is one of the main reasons for getting a flexible monitor stand or arm. However, not all products are the same when it comes to ergonomics, which can also be said about monitors. Some stands offer height, pivot, swivel, and tilt adjustments, with wide ranges for all of them. Others are more limited, only offering height and tilt options. Of course, monitor stands with full adjustment are not automatically the best options for everyone. If you simply want to increase your monitor’s height, then a monitor riser will be enough for you. But if you want full control over the screen position, especially for a multi-monitor setup, then go for a monitor arm with full adjustment. Although most VESA mount-compatible monitors come with a 100 x 100 mm VESA mount on the back panel, there are also displays that are equipped with a 75 x 75 mm VESA mount. One notable example is the LG 24MP88HV-S, a thin-bezel monitor that will work great in a dual monitor setup. When shopping for the best monitor stands, make sure the connector is compatible with the VESA mount of your monitor. The good news is that almost all monitor arm mounts on the market are compatible with both of the aforementioned VESA mount sizes, so the chances of you ending up with incompatible VESA mounts are extremely low. Except for the two monitor risers, all products on this list offer compatibility for both 75 x 75 mm and 100 x 100 mm VESA mounts. If your monitor doesn’t have a VESA mount at the back, check if there are special adapters available, either on Amazon and other online stores or at the manufacturer’s official store. The Asus MX27AQ, a 27-inch monitor with a fixed stand, is a good example. You can only mount it to a VESA monitor arm if you use a special adapter, which, unfortunately, is sold separately. The AmazonBasics Premium Single Monitor Stand is the best option if you want an easy-to-use arm mount for your monitor. It’s made of aluminum and attaches via a well-secured desk clamp. It offers full adjustment options, including pivot to portrait mode, and can extend outward up to 25 inches. Compatible with 75 x 75 mm and 100 x 100 mm VESA mounts, this well-built single monitor stand from AmazonBasics can support monitors with a screen size of up to 32 inches and a weight of up to 25 pounds. That pretty much covers some of the best monitors for productivity out on the market, including the Dell U2718Q and the LG 32UD99-W. Some customers have also reported being able to mount even larger displays – such as a 34-inch ultrawide monitor – without any issues. 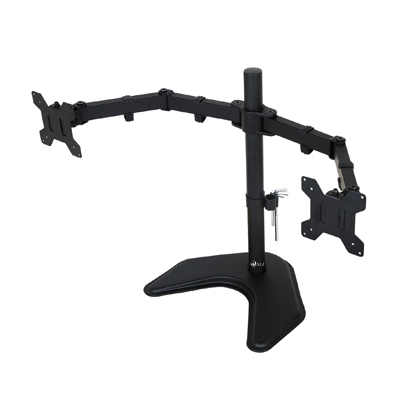 Overall, this monitor arm is an excellent product, offering great value for the money. If you don’t want to spend more than $50 on a monitor stand – whether it’s for a single monitor or a dual monitor setup – Vivo is one of the first brands you should check out. The company offers some of the most affordable stands on the market, with the STAND-V001R being one of the best. A single monitor stand, the STAND-V001R can easily support a 27-inch display, provided the monitor’s weight is under 13.2 pounds. 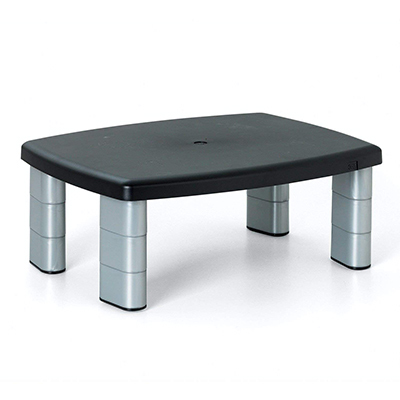 Made of sturdy metal, this Vivo monitor stand has a freestanding design, which means it simply looks like a regular monitor stand with a flat base. It’s a lot easier to transfer to another table compared to a monitor arm with a clamp installation. Featuring a gas spring arm with decent adjustment options and integrated cable management, the STAND-V001R is a great product overall. 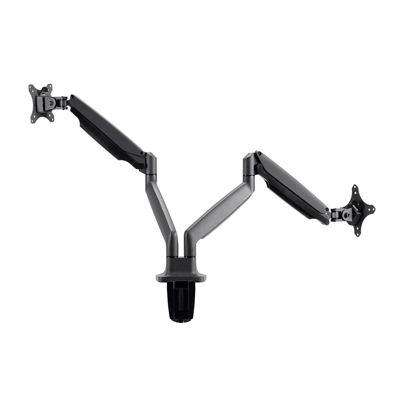 If you prefer a clamp-style arm mount, you can check out the other versions of this product. A dual monitor stand, the Monoprice 115525 is a well-designed product that offers excellent value for the money, especially if you are using your dual monitor setup for productivity. You can get it for less than $100, which makes it a lot more affordable than the dual mount version of our top pick from AmazonBasics. Of the arm mounts in this guide, it has the best officially listed screen size capacity, capable of supporting up to 34 inches, with a 19.8-pound weight capacity for each arm. This Monoprice dual monitor stand is made of steel and aluminum, featuring gas spring-equipped arm mounts and integrated cable management. You can easily adjust the position of the arms, with options to adjust the height, tilt, swivel, and pivot to portrait mode. The clamp is also easy to install, but make sure your desk is thick enough. If you have a dual monitor setup for productivity and want a more clutter-free desk, get this monitor stand from Monoprice. If your monitor’s fixed-height stand is giving you issues, check out the AmazonBasics Adjustable Monitor Stand, a budget monitor riser with an adjustable height. It’s made of plastic, with a weight capacity of 22 pounds, which is not that impressive, especially compared to the other monitor riser in this guide. The platform is about 16 inches in length while the max height adjustment is just under five inches. Capable of supporting most 27-inch monitors without breaking a sweat, this minimalist monitor stand comes with non-skid feet for a more secure setup. The wide space underneath the platform can be used to store books, tablets, and even a PS4 if you are using your monitor for console gaming. While not exactly a premium product, this AmazonBasics monitor stand gets the job done. It’s great for monitors such as the BenQ EL2870U and the Acer R240HY. The 3M MS80B, an adjustable monitor riser, is another great option if you want a basic solution to your monitor’s fixed stand. It’s a bit more expensive than the AmazonBasics product above, selling for around $25. It has a rather unappealing design, with a black platform and silver legs with a non-skid design for a more secure setup. But in terms of functionality, it’s just as good as the AmazonBasics monitor riser. Featuring a max height adjustment of around 5.9 inches, the MS80B can easily support most monitors, even the larger ones with a screen size north of 30 inches, provided the monitor’s stand fits on the 15-inch platform. It’s got an impressive weight capacity of 80 pounds. The 11-inch space under the platform can be used to store different items, from your keyboard and mouse to books. In all, this 3M monitor stand is a good product overall and works as intended. The Wali MF002 is a simple dual monitor mount with a freestanding design, which means there’s no need for a clamp or grommet to install it on your desk. The trade-off is that it takes up more space than a clamped monitor arm. But on the bright side, it’s easier to move if you are switching desks or simply moving it to a different position on your desk. A sturdy mount with an all-black finish, the MF002 has cable management in both arms, which comes in the form of small loops, and an integrated tool holder in the main pole. It can easily support monitors up to 27 inches in size and up to 22 pounds in weight per arm. While not as flexible as the Monoprice dual arm above, especially regarding height adjustment, this affordable Wali dual monitor stand gets the job done and will look great in a typical office setting. Unlike with single mounts and dual monitor stands, there aren’t many options when it comes to quad monitor stands. If you are looking for a space-saving stand for your quad monitor setup, check out the Vivo STAND-V004F, a simple stand with a steel and aluminum construction. It’s a sturdy unit, with each arm capable of supporting monitors up to 30 inches in size and 22 pounds in weight. Like the Wali dual monitor stand above, this affordable Vivo quad stand has a freestanding design, featuring a well-built base that can easily support a full load. Each of the arms has cable management, which is nice, while the main pole has an integrated tool holder. If you want a semi-permanent setup, Vivo also offers a desk-mounted version of this product, which has a clamp installation. If you don’t like the STAND-V004F’s base design, you can go for the freestanding variant that comes with a glass base instead. 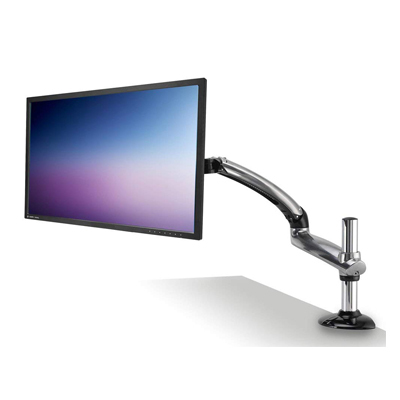 The Ergotech Freedom Arm HD is another excellent solution if your monitor has very limited stand adjustability. It’s slightly more affordable than our top pick from AmazonBasics, selling for just under $80. A single-mount unit, this Ergotech offering has a heavy-duty construction, with the capability to support monitors larger than the listed max screen size, provided the monitor’s weight is within the mount’s weight capacity. 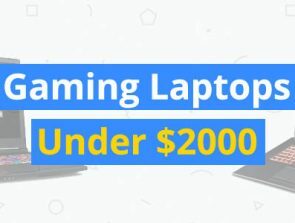 It can easily support monitors such as the LG 32UD99-W, the Dell Alienware AW3418DW, and the Asus ROG Swift PG348Q, all of which weigh less than 20 pounds without their default stand. Featuring full adjustment options, the Freedom Arm HD has a desk clamp installation and integrated cable management to keep your cables in line. It’s easy to adjust, features an arm extension of up to 26.7 inches, and supports monitors with a 75 x 75 mm or 100 x 100 mm VESA mount. If our top pick is not to your liking, check out this single monitor mount from Ergotech instead. If you are using three monitors for productivity and are in the market for a triple monitor stand, check out the Mount-It! MI-2753, a sturdy stand with a clamp installation. It’s got a well-built center mount and two gas spring-equipped arms with cable management. It can support monitors up to 32 inches in size, though the monitors have to be under 15 pounds. 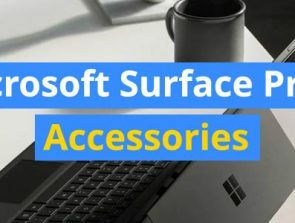 What easily separates the MI-2753 from all the products on this list are the built-in USB and audio ports in the base, which are useful if your monitors’ ports are not easy to access. The USB port is positioned too close to the desk, though, so particularly large thumb drives might have trouble fitting in. Easy to adjust, this triple monitor mount is a great product overall and will make for a much simpler triple monitor setup with a significantly reduced overall footprint. The AmazonBasics Premium Dual Monitor Stand is the dual variant of our top pick, selling for almost double the price. It’s got well-built arms that offer full adjustment options, with each arm capable of supporting monitors up to 20 pounds in weight. You can install it on your desk using either the clamp or the grommet mount. Like its single monitor counterpart, this AmazonBasics dual monitor arm has integrated cable management. 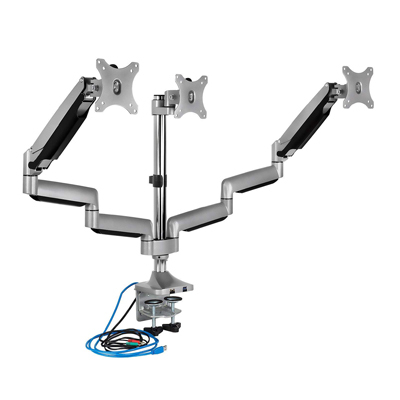 It’s easy to adjust, featuring an arm extension range of 25 inches for each arm, and it’s not that difficult to put together. Although it’s not exactly the most affordable dual monitor mount on the market, it’s a great product overall.